VSPARS has been working with Telefonica onboard their VO70. Whilst some of the rule changes from the last Volvo Ocean Race are subtle, the sail program has seen major changes. 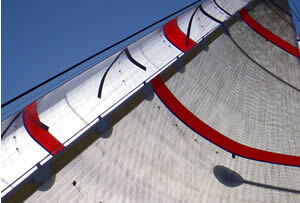 Significant limits on the numbers of sails means that now individual sails must perform well across a much wider range. Sail design and analysis has become that much more important for this edition of the race. Using VSPARS as a sail vision and analysis system allows teams a greater insight into their flying shapes. Couple this with a high level of usability and it's a winning combination. Jordi Calafat - sailor, strategist and designer for Telefonica and Alinghi who has been putting the system through its paces commented that “VSPARS is the most simple and fastest sail scanning software I have ever used”.